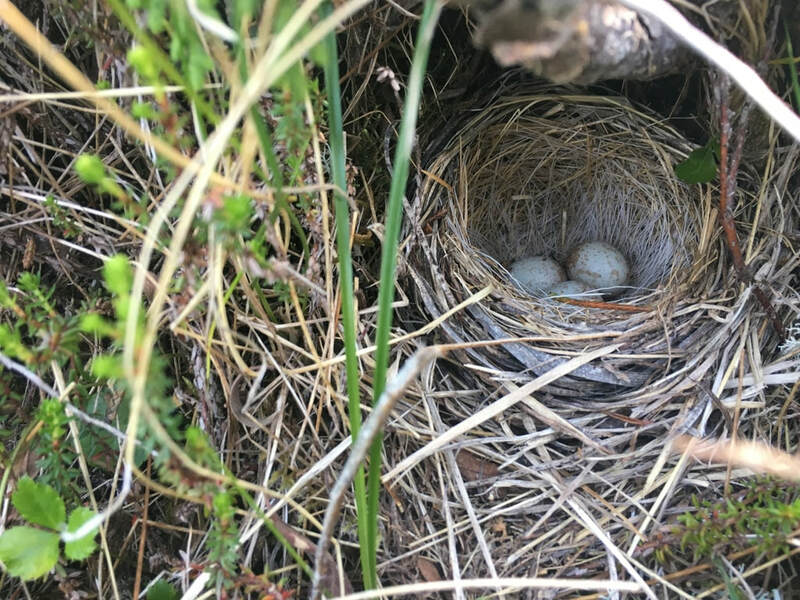 Photos by John Reynolds (top, adult), Christian Kelly (bottom left, juvenile in a western hemlock tree), and Aimée Pelletier (bottom right, nest with eggs). 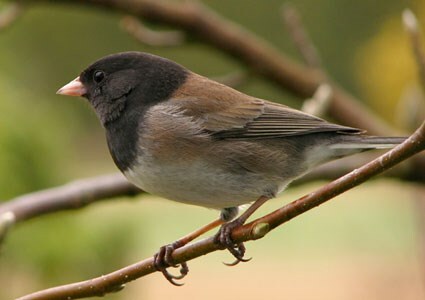 There are 15 different described subspecies of the dark-eyed junco, which are divided into a handful of broader groups. The Oregon dark-eyed junco, or just Oregon junco, represents the eight subspecies found in western North America. This form is characterized by a dark grey to black 'hood' (head, nape, and throat), and a pink bill. At the more western and northern parts of its range, like the Central Coast, it tends to have a darker hood, however females have lighter, duller hoods than males. The Oregon junco's back and sides tend to be buffy brown to rufous brown, and its belly is generally whitish. It usually has white outer tail feathers as well, which are visible in flight. Juveniles are streaked with rufous red, brown, and grey, and do not have the distinctive hood of adult birds. 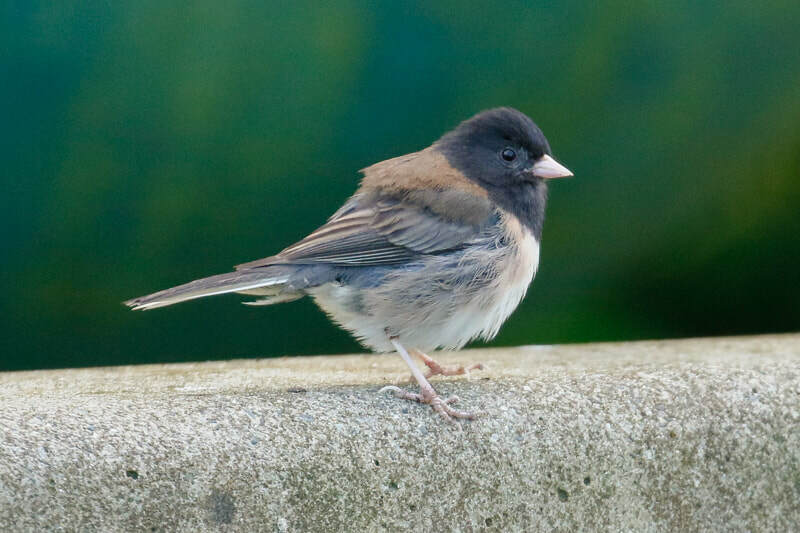 The dark-eyed junco ranges across nearly all of North America and south to Central America. Migrating populations are found throughout Canada in summer, then fly south to the US or further for winter. Year-round populations exist on the west and east coasts, including BC's Central Coast, and some areas of the western US. 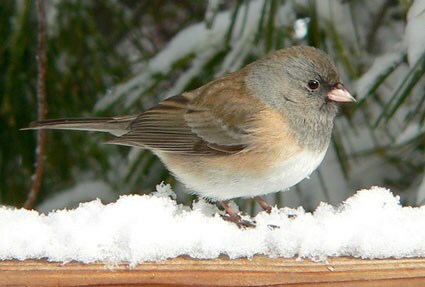 The Oregon junco subspecies are found in the western stretch of the bird's range. 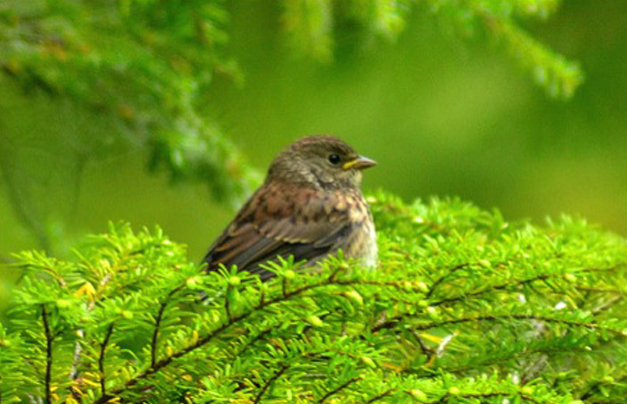 These birds usually breed in forests and are found in a wide variety of open habitats when not breeding. Adult song sparrow (Melospeiza melodia) plumage may appear similar to juvenile dark-eyed junco plumage, but streaking is usually less defined on junco juveniles. While 15 different races of dark-eyed junco are recognized, only six are identifiable and referred to in the field. See the Cornell Lab of Ornithology species page for more information on regional differences. Dark-eyed Junco Junco hyemalis. The Birds of North America Online (A. Poole, Ed.). Ithaca: Cornell Lab of Ornithology; Retrieved from the Birds of North America Online. Accessed 03/03/2013. Dunn, J. L. and Alderfer, J. (Eds.). (2006). National Geographic Field Guide to the Birds of North America. (5th Ed.). Washington, D.C.: National Geographic Society. Pp. 426-427.